It’s not as complicated as people think; to hire a photo booth in Morocco. Certainly, that’s not the Av1.ma way. Here, we do our best to keep things simple and beaming. Unlike other AV solutions, we’ve been able to offer one package – for everyone. We appreciate all of our clients equally, and we treat them all with the same quality of service – no packages. We’re reliable, we infuse your event with fun, and we’re available across Morocco. 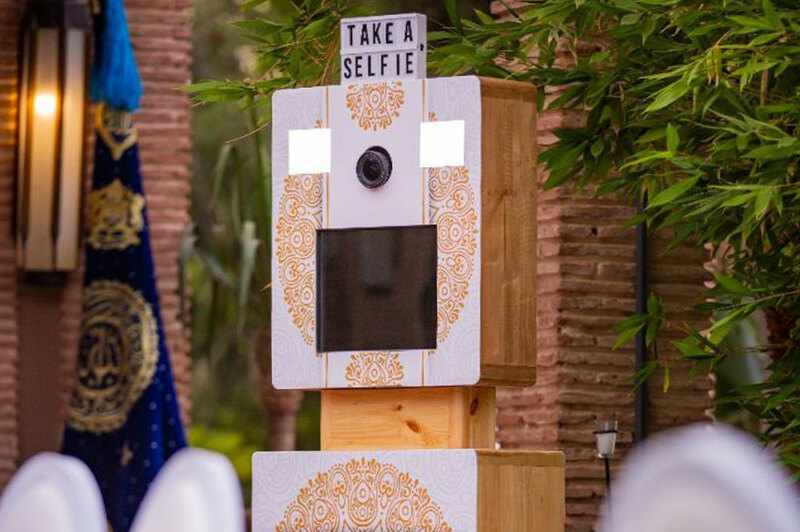 If your venue is in Morocco and you’re interested in being unique and different, check our range of photo booths. Av1.ma will provide you with the popular animated gif photo booth, as well as the printer station. Our materials are constantly being upgraded. Now, we’re using the fastest commercial Mitsubishi manufactured, Canon DSLR cameras that produce super-sharp photos, and 10-second photo printers. Recently, we have improved a new compact fluorescent lighting system; which offers a more flattering, high-quality pictures. Let us be the light of joy, if you’re in Morocco and looking to have a shining party. We’ll help you create unique mementos of your event; whether you’re having your anniversary, or your younglings are having their rites of passage, Av1.ma will, both literally and figuratively, light your event. Christmas parties, engagement parties, and any form of celebration where people gather in one place to have fun, we’ll be there to help you achieve a massive amount of fun. Check out our favorite pictures of parties. You will see people having fun and our presence at parties. We tend to make people enjoy their time. We’re the light of parties, and our staff is the funniest bunch; so, you’ll be getting a two-in-one offer. Professional equipment, and a hilarious team. Your wedding celebration will make everyone present feel more ecstatic and joyful – thanks to Av1.ma. 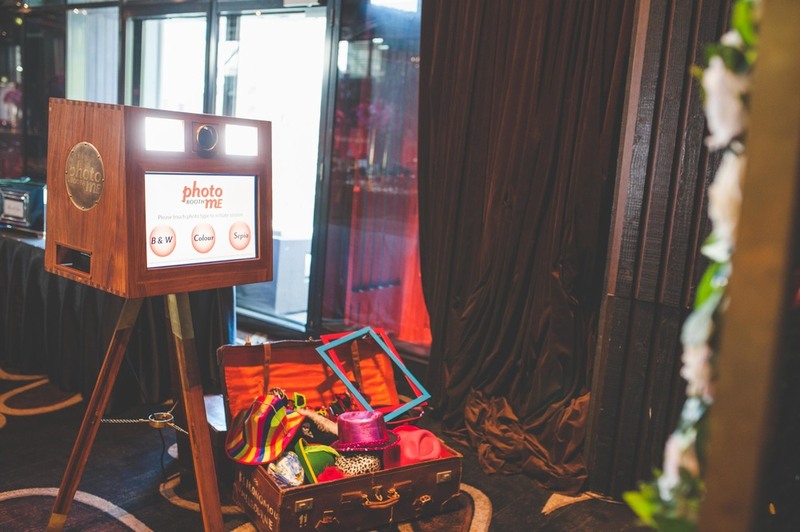 Each and every for-hire photobooth is an elegant and joyful addition to your wedding party. Let us entertain your guests with our wide array of photobooths, fun extras, and a team in uniform. They will make sure everything is in order, and they will help the smooth sail of your wedding celebration. Check our wedding photo booth to see how we infuse joy with professionalism. Instead of traditional photographs, you can have a unique wedding Instagram printer. Take photos, share them, and print them – in real time. Your wedding will be a success, and everyone will be making mementos and receiving gifts at your wedding. 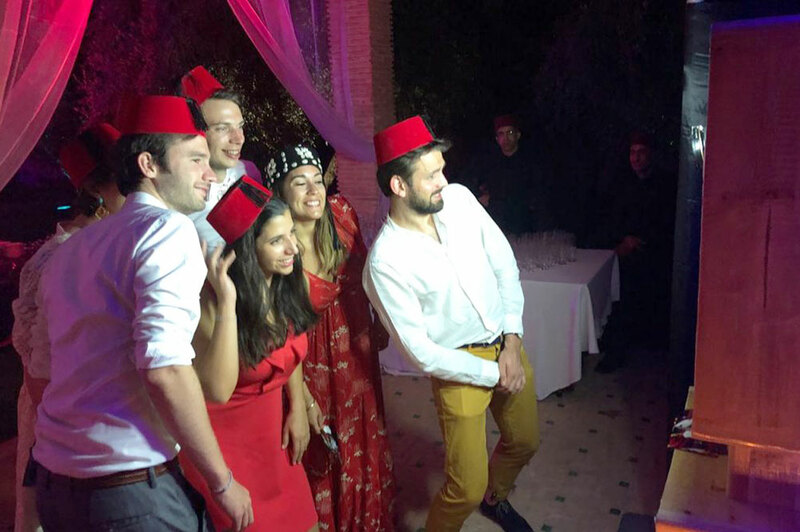 We are Marrakech’s finest photo booth hire company! We rock parties and bring life and joy to your event. We’ve been there for parents, couples, and children’s bar/bat mitzvahs. Needless to say, we’ve brought life to each and every one of these events. Let us work our magic, and we’ll transform your event into a joy-filled and elegant affair. No matter what your event is, and however you wish to celebrate it. We’ve previously worked with corporate clients – and we still do – we happen to be their favorite, mainly due to our ability to spoil their guests – and we take huge pride in that. Product launches, award ceremonies, business dinners, networking events, and Christmas parties, we’ve been present in all of those, and quite frankly, we’ve had the most fun with our corporate clients. Whether you’re looking for a traditional booth for some good ol’ fashioned ‘memory makin’ ‘ or you’re interested in a more trendy affair, Av1.ma will provide anything that you see fit for your party. Your guests, clients, and staff will have a tremendously joyful time with our Instagram hashtag printer. Also, it’s fully customizable with your own branding. This will allow you to have a maximum promotional impact.